I was asked recently if we have any standard photographs that we take at a wedding. While there are almost always the standard group photographs of the bridal party, bride and groom with parents and bridesmaids, we don't have a photo list we work to. As I frequently tell prospective clients, "it is your day, not ours", by this I mean that if we were to arrive at a wedding with a list of photographs that we planned to take, we would be imposing our preconceived ideas of how we expect the day to go, what we are expecting to see on your day. It is always our intention to stay back from your day and photograph what goes on with the minimal amount of interference, we as photographers need to remember who is working for who! having said the above there are one or two images I like to grab given half the chance, one of these is the bridal portrait which can be seen here. Our bride is ready with hair and makeup done, in here dress and ready for the off, this type of portrait always goes down well with clients and their parents. 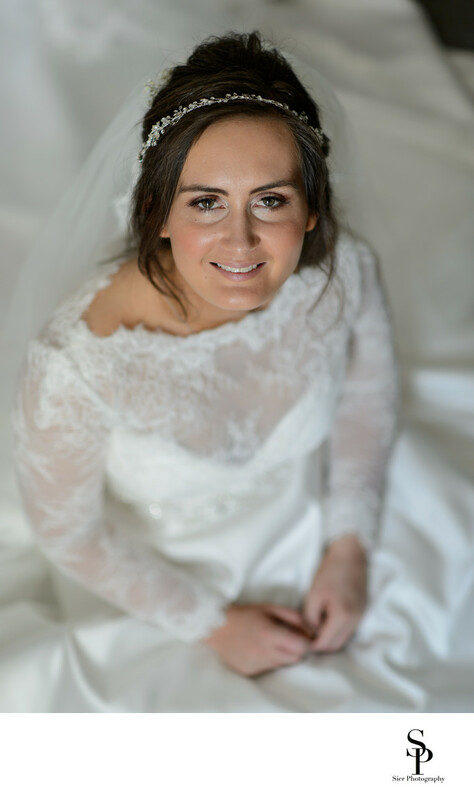 The bride in the image above had undertaken her bridal preparation at her home prior to her wedding at St Bartholomew's church in Old Whittington, Chesterfield, Derbyshire which was followed by her wedding reception at Ringwood Hall Hotel, Chesterfield, Derbyshire. 1/160; f/1.4; ISO 180; 85.0 mm.